JAKARTA, Indonesia -- A powerful, shallow earthquake hit off the southwestern coast of Sumatra in Indonesia on Wednesday, triggering a tsunami warning that sent islanders rushing to high ground. An official said the potential for a tsunami was small. The U.S. Geological Service said the earthquake had a magnitude of 7.8. It was centered under the ocean at a depth of 15 miles, it said. Shallow earthquakes are more likely to cause damage, but the USGS said the quake was located far from land, about 409 miles from the town of Muara Siberut. Andi Eka Sakya, head of Indonesia's Meteorology and Geophysics Agency, said there was only a small potential for a tsunami. There were no immediate reports of damage or casualties, he said. "I think its potential for a tsunami is very small," because the quake didn't occur along a major fault known as a subduction zone, he told TVOne. Indonesia, the world's largest archipelago, is prone to seismic upheaval because of its location on the Pacific "Ring of Fire," an arc of volcanoes and fault lines circling the Pacific Basin. A massive magnitude-9.1 quake off Indonesia in 2004 triggered a tsunami that killed 230,000 people in a dozen countries. Most of the deaths were in Indonesia's Aceh province on Sumatra. Marjina, a resident of Sikakap in the Mentawai islands, about 430 miles from the epicenter, said the quake was felt only weakly there, but the tsunami warning caused panic among villagers, who ran to higher ground. 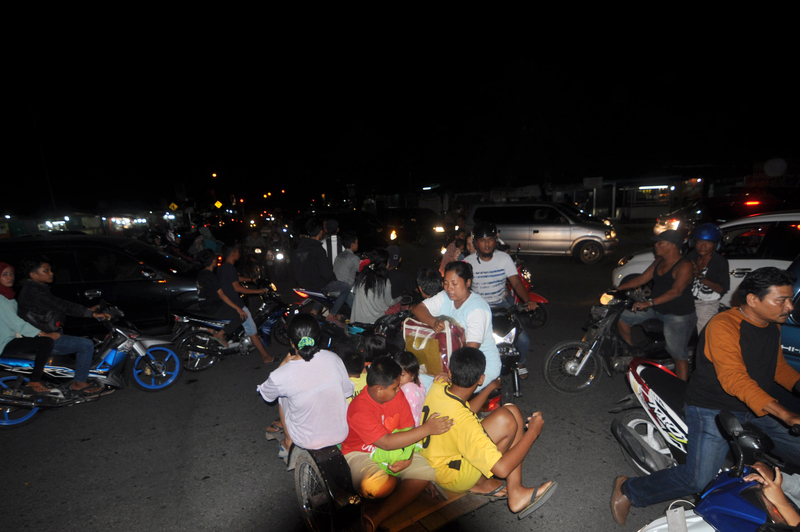 A resident of Siberut island, which is closest to the epicenter, said people evacuated to higher ground and were waiting for the tsunami warning to be lifted. Australia's Bureau of Meteorology issued a marine warning for the distant Cocos and Christmas islands. It did not advise evacuations, but said strong and dangerous currents were possible and people should secure boats and avoid waterfront areas. The Joint Australian Tsunami Warning Center issued but then canceled a tsunami watch for Western Australia. The Indian government issued a statement advising that no tsunami threat was posed for the Indian coast.